Walter Gropius, Le Corbusier and Mies van der Rohe, collectively know as “The Big Three”, developed the principles of modern architecture in Europe during the 1920’s and early 30’s. Their philosophy was famously exposed to the world at the extremely influential 1932 International Exhibition of Modern Architecture at New York’s Museum of Modern Art (MoMA). The ideals of this exhibition were adopted all across the globe, as Modernism from there after became the dominant style of architecture. Following the MoMA exhibition, the city of New York has played a profound role in the shaping of modern architecture around the world. While the city is packed full with buildings of outstanding quality, the Guggenheim Museum, Seagram Building and the AT&T Center stand out due to their enormous impact upon the course of architectural history. 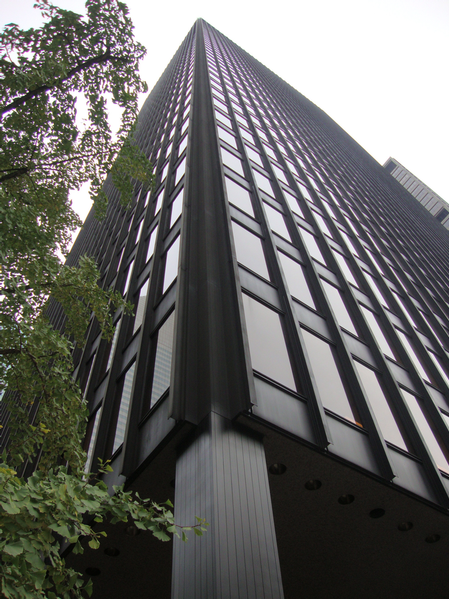 Constructed in 1957, the Seagram Building is the archetypical “International Style” skyscraper. Built by one of the big three, Mies van der Rohe, this building demonstrates the ideals of a movement that takes its name from an exhibition at the MoMA 25 years earlier. The building is constructed using an internal steel fame that supports the glass curtain wall, and the vertical bronze-colored I-beams of the exterior. The simplicity, honesty and rejection of all ornament, ideals that are synonymous with modern architecture, are displayed for all to see in this building. The International Style is ideally suited to skyscrapers, and thousands of similar looking buildings have risen across America, but Mies van der Rohe’s masterpiece is still undoubtedly the greatest. The Guggenheim Museum is one of America’s best-known buildings, designed by her most famous architects, Frank Lloyd Wright. 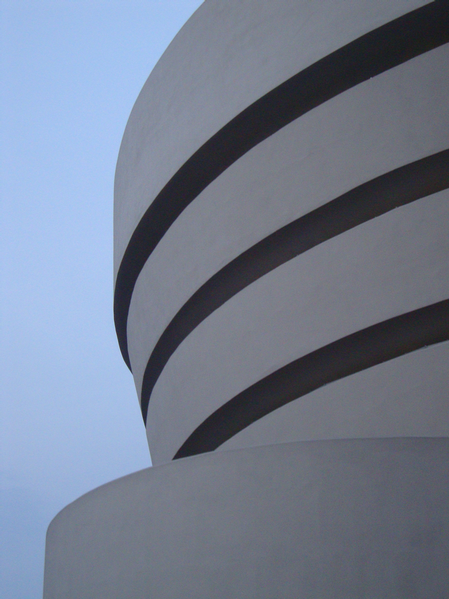 The Guggenheim’s sleek curves come as a breath of fresh air in the sharp contrast to the straight lines that dominate Manhattan’s buildings. Wright’s innovative design challenged conventional museum construction. The standard organization of “exhibit in a box” was replaced with artwork displayed in an elliptical spiral starting in the entrance hall rising upward. 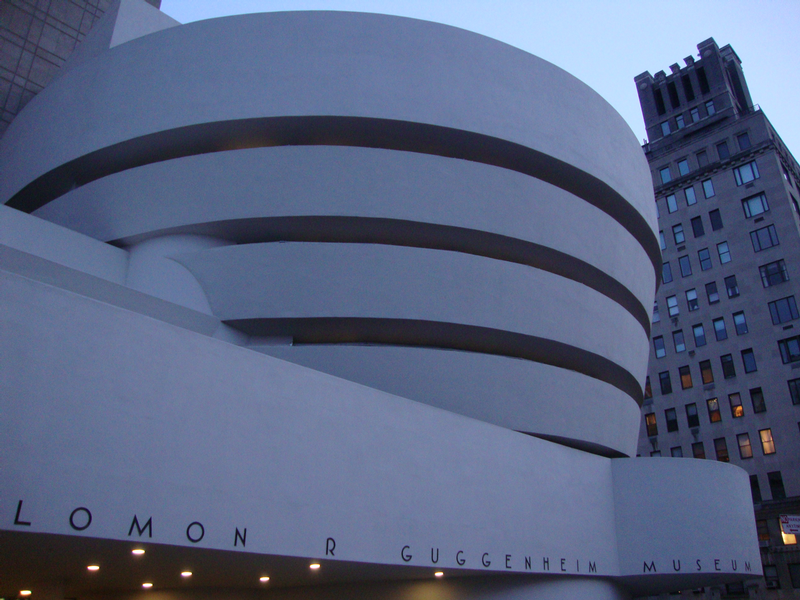 Frank Lloyd Wright’s masterpiece demonstrated that museums and art galleries do not need to be sterile boxes, and that an interesting space can enhance the visitor’s experience. The AT&T Center (now the Sony Center) may not look too shocking today, but in 1984 it defied established ideas on modern architecture. 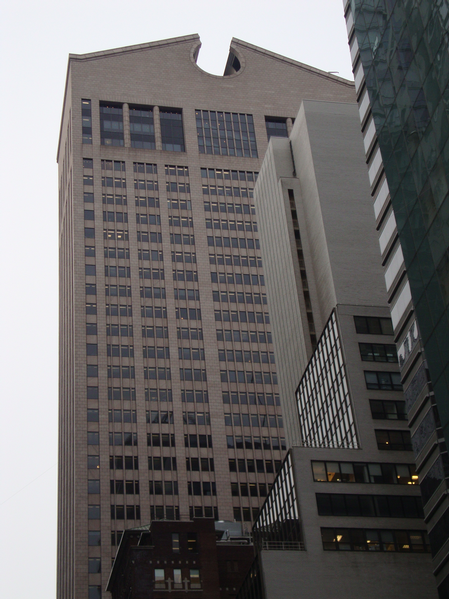 Pritzker Prize winner, Philip Johnson’s, building was one of the first, large scale, New York skyscrapers to reject the stark unadorned striped down architecture of the International Style. The Georgian, “Chippendale” pediment on top of the building is purely ornamental, as is the seven story arched entrance. These features aimed to add an element of the past to this modern structure, which went against the principles of Modernism at the time. The AT&T Center is an early example of Post Modernist architecture and was a massive part of legitimizing the movement around the world. The AT&T Center is far less famous than the Seagram Building or the Guggenheim but had an equally important role in the development of architecture. These three buildings, which changed the course of building history and have influenced architects all over the world, and now stand as monuments to the time they were built and styles they influenced.